Who Owns These Two Houses? This image shows a 20 room mansion (not including 8 bathrooms) heated by natural gas. Add on a pool (and a pool house) and a separate guest house, all heated by gas. In one month, this residence consumes more energy than the average American household does in a year. The average bill for electricity and natural gas runs over $2400 per month. In natural gas alone, this property consumes more than 20 times the national average for an American home. This house is not situated in a Northern or Midwestern ‘snow belt’ area. It’s in the South. This image shows a residence designed by an architecture professor at a leading national university. This house incorporates every ‘green’ feature that current home construction can provide. The house is 4,000 square feet (4 bedrooms) and is nestled on a high prairie in the American southwest. A central closet in the house holds geothermal heat-pumps drawing ground water through pipes sunk 300 feet into the ground. The water (usually 67 degrees F) heats the house in the winter and cools it in the summer. The system uses no fossil fuels such as oil or natural gas, and it consumes one-quarter the electricity required for a conventional heating/cooling system. Rainwater from the roof is collected and funneled into a 25,000 gallon underground cistern. Wastewater from showers, sinks and toilets goes into underground purifying tanks and then into the cistern. This collected water then irrigates the land surrounding the house. Surrounding flowers and shrubs native to the area enable the property to blend into the surrounding rural landscape. The heating/cooling system is so efficient that initial plans to install solar panels were canceled. The first house in the top image covers more than 10,000 square feet and is at Belle Meade, an upscale city suburb of Nashville, Tennessee, and is the home of the ‘Environmentalist’ Al Gore. The second house is on a ranch near Crawford, Texas and it is the residence of the former President of the United States, George W. Bush, who we are endlessly told is a noted environmental vandal. Gee! Sounds a little like an inconvenient truth to me. Sometimes people can tend to mention things that enhance their own points of view, and this may seem to be one of them, but, hey, if you don’t believe me, go here to this link and check for yourself. It’s all true. Is it not true, that Al Gore owns 5 mansions in total? Plus a jumbo-jet, 5 chaufeur driven SUV’s and also makes heaps of money (or at least tries to) from his carbon trade investments in Europe? It is the same person, with other multi-millionaires and billionaires, like George Soros, Richard Branson and others, who pollute the air prodigiously and tell us, the lower-class persons, not to pollute! They are just a bunch of true hypocrites! Nice post, keep up the interesting work. The jury is still out on who will have been more friendly to the ecosystem, President Bush or President Obama. Thanks for another inconvenient truth! Well done!! Thanks. There are a lot of inconvenient truths, aren’t there? You’re noticing that, too? The largest of the growing inconvenient file: the farce that is Global Warming. And now, the great liberal lie of global warming is a fact, isn’t it? Yes, I’ve noticed a few truths as well. Global warming is based on nothing but someone’s active imagination. It’s great for selling movie tickets, no so much for reality checks. Hitler was an evil genius, I’m sorry to say, but it IS true. 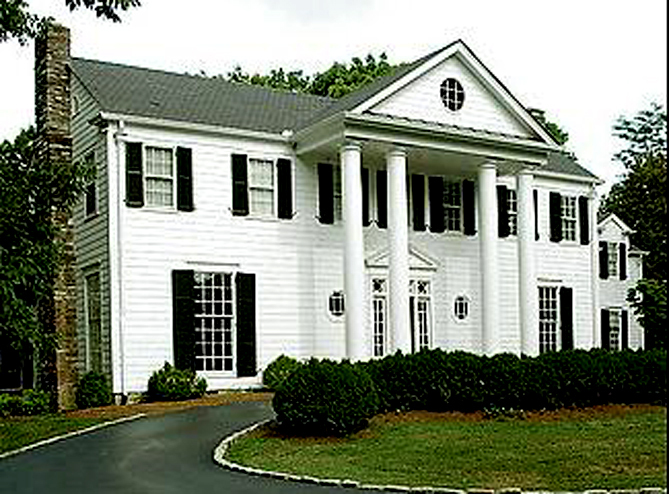 The first image shown is not Al Gore’s Belle Meade home. This is his old house on the family farm in Carthage. I’ve passed by it on many occasions, and while it is a large ranch-style house, it is not a 20 room mansion. Gore has not lived in this house for a long time. Thank you for your correction. We’ll look into it. Right now Tony is snoozing. It’s the middle of the night in Australia right now. Supporters for Gore also indicate that he has taken initiatives to purchase the electricity the residence uses from ‘green’ sources. Even though sounding great, this is an impossibility. The electricity your residence consumes is supplied from the grid, the overall grid. Power generators in that area supply their power to the grid for that area and consumers are connected to the grid. ‘Green’ power generators make up a small part of that grid and add to the overall total power on that grid. Individual residences cannot source their power solely from ‘green’ producers, as they are connected to the overall grid. True, the Authority supplying the power to the individual residence can offer the option of ‘paying’ for ‘green’ power. All that means is the electricity supplied to your house is charged at the considerably higher rate, because ‘green’ power sold to the grid by the generator costs considerably more than conventionally generated power. It is all really moot, because the electrons running down the wire to that residence don’t know if they come from a ‘green’ source, as all the power on that grid comes from numerous sources and is all in together. The intent of this post still stands. Gore painted his opposites as vandals, while in fact Bush was actually DOING more on the personal front than Gore was doing himself.